Pete's prior book/CD, The Versatile Drummer, covered the drumming basics including today's most common musical styles. This volume gets more specific by concentrating on a subject that many drummers have problems with - the fine art of drum fills. Let's check it out. Music Terminology and Note Values - Includes basic music notation terminology, note values, and commonly used symbols for notating music. Hand and Foot Coordination Studies - Learning to use the bass drum and hi-hat in combination with the hands. Getting Started with Drum Fills - Introduces the theme and variation fill style along with the melodic approach. Sixteenth-Note Drum Fills - One, two, three, and four beat fills and using fills as pickups are included. Triplet Drum Fills - Fills in the eighth-note triplet form over one, two, three, and four beats. Also incorporates various flam rudiments. Advanced Drum Fills - Fills using sixteenth-note triplets and thirty-second notes in the hands and feet. This section includes fill patterns that are appropriate for a variety of musical styles. 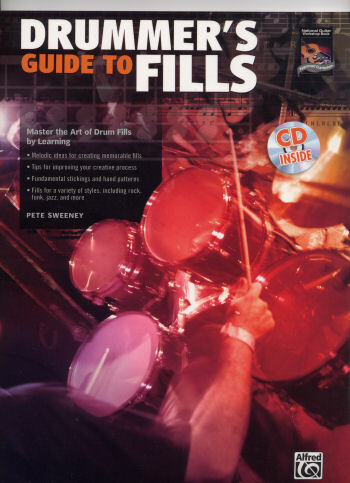 This 79-page book represents a good introduction to drum fills that can be used by anyone looking to improve their fills in musical styles from rock to funk to jazz. It will also help one's musical approach to drum fills. The included audio CD will help ensure the correct interpretation of the written patterns. Recommended to all those in need of help with their fills. At a retail price of only $19.95 for both the book and CD, this represents a great value. From Alfred Publishing and the National Guitar Workshop.